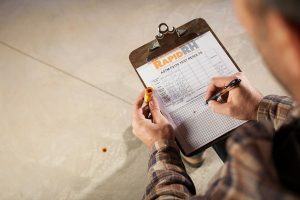 Home » The Rapid RH® Concrete Moisture Test » Concrete Information & Knowledge Base » Why Measure Moisture in Old Concrete Floor Slabs? This article was originally published by The Flooring Contractor in the Winter 2017 issue. Older concrete is not always dry enough to ensure a successful floor installation. Here’s a pop quiz for all of you flooring installers. You’ve got a 30, maybe 40-year-old concrete slab that “looks and feels” dry. Is it dry enough to install new flooring and coating materials? Before you answer, consider this . . . concrete slabs on ground poured 30 or 40 years ago probably didn’t have a proper vapor retarder installed. And if a proper vapor retarder was installed, it has likely deteriorated and may no longer provide adequate moisture protection below the slab. In this case, unless you install a moisture control system on top of the slab, moisture may be able to move to the slab’s surface, potentially leading to serious problems; even floor covering failures. That’s why it’s always imperative that you take the time to assess a slab’s current moisture condition — even the old, supposedly dry, slabs. In fact, it’s estimated that moisture-related flooring problems cost contractors, installers, manufacturers, and property owners an estimated $1 billion annually because of call-backs, repairs, and disputes. Now back to our pop quiz question — is a 30 or 40-year-old concrete slab that’s dry to the touch also dry enough to install new flooring and coating? The correct answer: Not necessarily. If a concrete slab is “old,” that is, one year or older, it’s sufficiently dry for installation. If the slab’s surface feels and looks dry, it’s ready for an install. Unfortunately, an “old” concrete slab or one that appears “dry” can be deceptive. In the case of old concrete, if it’s already had flooring installed over it, it seems logical that it must be dry enough for new flooring. Older flooring systems often used products that were more moisture-resistant than many of the products used today, but also typically had a greater environmental impact. 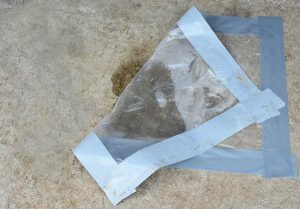 This means that an old concrete slab may be retaining moisture that was sealed by the older, more moisture-resistant flooring. Although this moisture may not have harmed the older flooring, it could certainly damage new flooring that’s not as moisture resistant. For these reasons, never assume an older slab is sufficiently dry for a new flooring installation. Moisture-related flooring problems have always plagued the industry. However, as formulations began to change for specific applications, it has become increasingly important to ensure that concrete slabs under the flooring installations are sufficiently dry to prevent moisture-related problems later. With the more recent focus toward lowering VOCs (volatile organic compounds) in products used in the construction industry, today’s flooring products and adhesives can vary greatly in their tolerances to elevated moisture conditions. For best results, always evaluate the slab’s moisture condition before proceeding with any flooring installation. Installers should also be certain the product specified is compatible with the slab’s moisture condition. What about an older concrete slab whose surface appears completely dry? In this case, an installer may believe this gives him the green light to proceed with an install. Studies have shown that the dryness at the surface of a concrete slab won’t necessarily reflect the slab’s overall moisture condition. Ambient conditions around the slab, such as temperature, humidity, and airflow, can cause the slab’s surface condition to be very different from what’s going on below, where it matters most. In addition, after old flooring is removed, moisture that’s been trapped in the old slab will begin moving to the surface and evaporate. Once this happens, a moisture gradient invariably forms so that the moisture condition deeper within becomes different than at the surface. Therefore, a concrete moisture test that only measures conditions at the surface, such as with a moisture meter or the widely used anhydrous calcium chloride test, is potentially risky. While these tests may accurately describe moisture conditions at the surface, they fail to reveal the slab’s overall moisture condition — especially moisture deep within the slab. And that can lead to serious problems. Avoid surface tests; they won’t tell you about the moisture condition within the concrete slab. 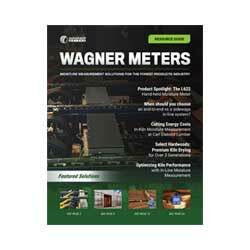 Moisture meters, while a useful survey tool, typically operate at about ¾” depth and can be susceptible to rebar, aggregates, and more within the slab. The calcium chloride test (or MVER) has been shown to measure moisture conditions in the top ¾ inches of the slab only. No surface test tells an installer how much moisture is present deeper within the concrete – which is critically important, as that moisture gradient will equalize if a non-permeable floor covering is installed. Scientific studies have shown that surface tests often give readings that are not indicative of the slab’s overall moisture condition. Assuming for the moment that the slab actually has an intact vapor retarder, we know for the long-term performance of any floor, what really matters is the slab’s point of moisture equilibrium. This occurs after flooring is installed, when moisture can no longer evaporate from the slab’s surface. The existing moisture gradient from top to bottom then tends to even out, creating an equilibrium and a moisture condition at the slab’s surface that may be very different than at the time the flooring was installed. This is the actual moisture condition that the installed flooring will “see” for the long haul. With this in mind, it has been demonstrated that the only way to get an accurate, reliable assessment of this “true” overall moisture condition in older concrete is by taking moisture measurements at specific depths – 40% depth for a slab drying from one side, and 20% depth for a slab drying from two sides. The in situ RH test is scientifically proven for accurate, reliable testing of concrete moisture. This is what in situ relative humidity (RH) testing is specifically designed to do. RH testing performed according to the ASTM F2170 standard is based on modern science and engineering principles. It’s also fast and affordable. Now if the RH numbers were to come back high, indicating that the concrete is too wet for a successful floor installation, the question, of course, would be why? Does the slab lack an intact vapor retarder? Most likely, the answer is yes, although taking core samples would address this question for sure. The best approach may simply be to apply a sealer on the concrete to mitigate for the slab’s unsuitable moisture condition. Flooring contractors should always remember: When preparing to install any type of flooring over an old or seemingly “dry” concrete floor, don’t assume that the concrete is actually dry enough for a successful installation with today’s flooring products. First, conduct an in situ RH test. 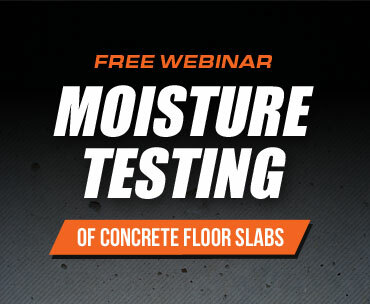 It’s the only proven test method giving consistent, reliable information about the slab’s overall moisture condition. 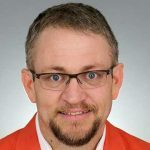 It really helps to know these tips ahead of time before hiring someone for a fix! That way you are more aware of the steps and the way it all works! Thanks for sharing this helpful info! !